I remember a time when I didn't wear eye shadow. It wasn't even that long ago. I preferred keeping my eye makeup simple, with eye pencil and mascara. Then something happened: I finally learned how to apply eye shadow! See, the real reason behind not wearing the eye shadow wasn't because I was going for a "clean" look, it really was because I didn't know how to put eye shadow on. But after I learned the art of eye shadowing, oh man, a whole new aisle in the makeup section opened up for me! I usually like to keep eye makeup simple, which translates into one color at a time, when possible (no MAC drag queen look for me). Also, most of the times, I get stuck with one color for the whole season: let's see, there was the shimmery white season, the gray season, the light blue season, the dark blue season. This winter I'm craving purple! 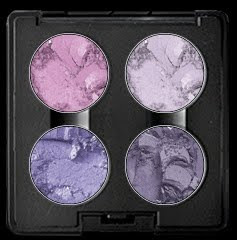 I think I am going out there today, and instead of focusing on my Christmas presents list that is still waaaay unfinished, I think I might go out there and waste some time in the makeup section, looking for my next purple eye shadow!